All told, the International Facilities Management Association reports that around 70 percent of us work in open office environments. For some of those people, especially those who are used to working in a closed office or a cubicle, adjusting to the hustle and bustle of a more open floorplan can take a bit of thought. With help from office designers, facility managers and company leaders, employees can stay engaged, productive and happy working in the era of the open office. 1. Allow employees to change their environments on the fly: Mobile privacy screens can mean the difference between productivity and distraction. Whether workers need privacy to focus on their own or privacy in a small group, the ability to physically separate from the rest of the open office can be crucial. Pin Mobile screens create workspace division to support collaboration or focused, individual tasks. Used alone or in clusters, Pin Mobile rolls on casters to customize the office environment in a flash. 2. Move away from official or implied assigned seating: One perk of the open office is that it allows people across teams and functions better access to each other. But humans are creatures of habit, and if we aren’t conscious about creating these opportunities for access, we’ll miss out on them. Ben Waber, who studies behavior and workplace design as the CEO of Humanyze, predicts that in the future, artificial intelligence will suggest where people should sit each day based on the work to be done. “If you go there, the right stuff is probably going to happen,” he says. “You’ll probably bump into the right people. You’ll probably be near people you need to work with that day.” Until then, we’ll have to take responsibility for where we land, and not be afraid to switch it up. 3. 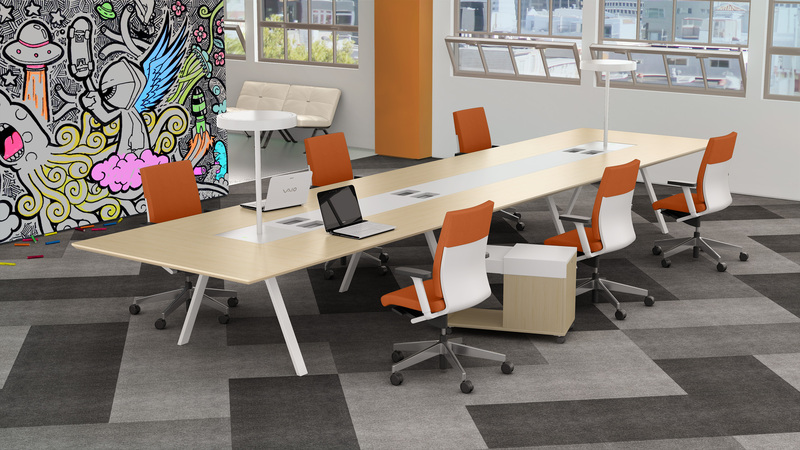 Design designated meeting areas: If your open office design forces employees to meet in the same worksurface and benching environments where people are working individually, then distraction and frustration are inevitable. Build in separate meeting spaces – complete with power delivery, media options and whiteboards – so people can break away and innovate without bothering those who aren’t part of the discussion. 4. Start with sound: HOK reports that “in environments with white noise, or sound masking, employees report improvements of up to 38% for the performance of simple tasks and 27% for complex tasks.” In instances when ambient noise is no match for environmental din, headphones could be the answer. Here’s one roundup of some of 2017’s best models. 5. Communication doesn’t always mean collaboration: Headphones aren’t just good for providing background noise – they’re also an indicator that someone is in task mode and not interested in casual chats. But employees shouldn’t rely solely on such subtle cues to indicate their need to focus. Open offices work much better when lines of communication are open as well – foster an environment where requests for time, space and privacy are honored and respected. We’re working in the era of the open office. Let’s make it productive.